Gaza’s devastated infrastructure and fuel shortages cause avoidable deaths. A crowd-funded initiative will save lives with solar power in hospitals. It has been eight years since Israel imposed a paralysing blockade on the Gaza Strip, during which time it has launched numerous military offensives against the Strip, crippling its economy and demolishing its infrastructure. During each assault, Israel invariable attacks the electricity network. In addition, fuel shortages mean that Gaza suffers from daily blackouts. With this in mind, a group of doctors setup EmpowerGaza to bring light to the area’s emergency services. One of the driving forces behind the project is Dr Tarek Loubani, an emergency room physician and assistant professor at Western University in Canada. Loubani has worked with hospitals in Gaza for many years, taking physicians to teach local doctors advanced cardiac and trauma life support at al-Shifa Hospital. Al-Shifa, Gaza’s largest hospital, has been fitted with solar panels for several years, which has helped it to continue operating even during the darkest of times. With this in mind, Loubani and his team looked into which other hospitals in the territory would benefit from a similar setup. In the first phase of the project, EmpowerGaza looked at hospitals with intensive care and dialysis units. al-Aqsa, Kamal Adwan, European Gaza and Rantisi Children’s hospital all fitted the bill. With the help of an Indiegogo campaign, which raised over $215,00, EmpowerGaza has enough funds for its pilot project at al-Aqsa Hospital. The project received the support of local doctors, healthcare workers and decision makers. “Even the patients who have heard about the project are incredibly excited by how hard we are working to make it a reality,” Loubani explains. The project has not encountered any major obstacles which Loubani attributes to the fact that “people all over the world want to help Palestinian patients and are sympathetic to their search for the human right to have access to adequate healthcare”. The EmpowerGaza team have been overwhelmed by the positive responses they have received from across the world. The project has received donations from over 50 countries. Loubani hopes that EmpowerGaza’s partnership with the United Nations Development Programme (UNDP) will ensure that it is able to navigate its way around the Israeli-imposed siege on Gaza which stops most aid and materials from entering the Strip. The UNDP is the only organisation that is permitted to transport construction materials into the Gaza Strip. “We are very optimistic that the project will be completed successfully. We have been working for over a year to ensure that it is a success, and our biggest obstacle now is funding the project so that we can start buying and installing the solar power modules,” Loubani explains. 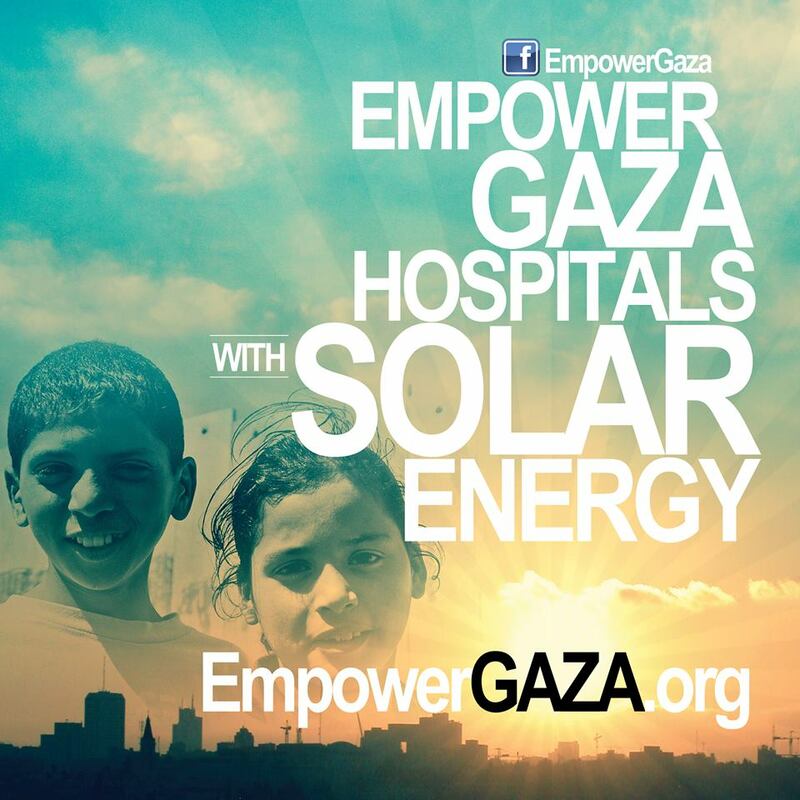 The EmpowerGaza team hope to install solar panels on all of Gaza’s 14 public hospitals. They also hope to expand the scope of the project so that it can cover more than essential medical services and further reduce the hospitals’ conventional energy needs.